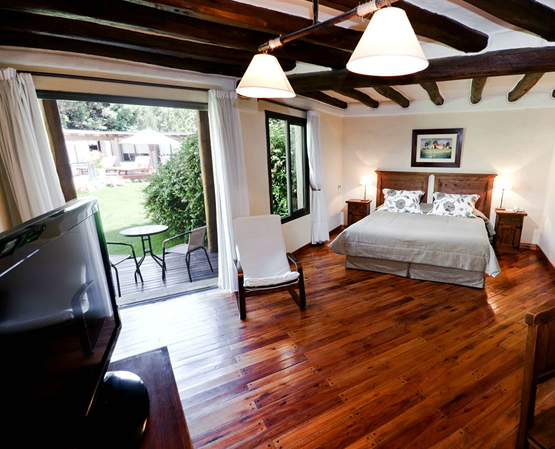 This hot hotel, is built in one of the most traditional areas of Mendoza, Chacras de Coria. Tthe most important thing at Lares de Chacras is that our guest feels like they are at home and enjoy the place. This country style house reflects the art of combining Andean stone with typical desert wood, bringing out a natural, simple and modern look. It is located in the middle of the gastronomic pole of Chacras de Coria which guarantees a various cover for the different palates of its guests during day and night. The minute the guest walks in, it is obvious he is in a land of wines. 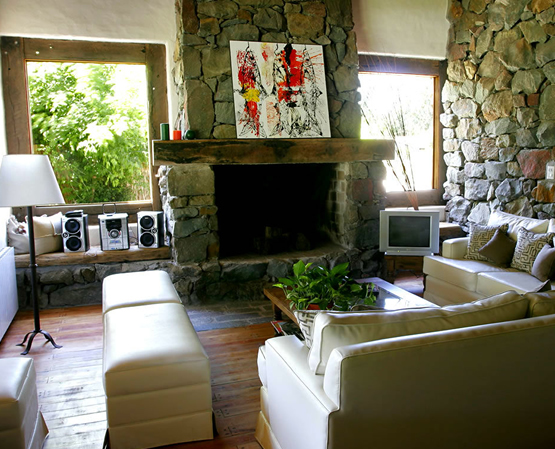 An original window stands out on the floor, allowing a view of the subterranean wine cellar, covered in stone and wooden trunks, a beautiful living room decorated with wood brought from the mountains of Mendoza reflects the stone walls with firewood and television. Here the guests can enjoy the comfortable chairs reading a good book or planning excursions. In each space of the house, wooden trunks rescue with good flavor the rustic style of the southern construction of the country; style that served of inspiration in the general architecture of Lares de Chacras. The swimming pool is about 5x9 mts, with a maximum depth of 1,80 mts and surrounded by a peripheral gate. On one side of the pool there is a Jacuzzi with a capacity for 6 people, with water propulsion and bubbles that give you a pleasant relax after a day of touring. Both of them can have the temperature conditioned to the preference of the guests. Massages and manicure services could be requested for guests (payable service). The hotel has implemented a food service that compliments the offer Chacras de Coria has, for example, empanadas and red wine from Finca El Reposo, tomatoes with our own extra virgin olive oil “Vita Mediterránea” made with olives from our farm, and weekend specials. The hotel has a mini store where you can buy wines, olive oil, homemade jams, Gourmet products “De Mi Campo”, Lares de Chacras merchandising, etc. Concerning to events organization, the beauty and quietness of the house is a perfect invitation for business events, work days, conventions, seminars, product presentations, with a personalized service in a calm environment, far away from the noise of the city. If the “quincho” is previously reserved, events or work meetings can be carried out for up to 25 people, or up to 15 people in the wine cellar. Lares de Chacras offers 10 large rooms with capacity for 25 people. It is the best part of the house that combines country style and the services the guests need. All rooms are decorated with tasteful details and are flexible in a way that they can be prepared as single, double, triple and even quadruple rooms. The maximum number of people for the house is of 25. Regarding services, we offer wireless internet, air conditioning, central heating, safety deposit boxes, cable TV and telephones (Direct dialling). Wine Cellar: The minute the guest walks in, it is obvious he is in a land of wines. An original window stands out on the floor, allowing a view of the subterranean wine cellar, covered in stone and wooden trunks. 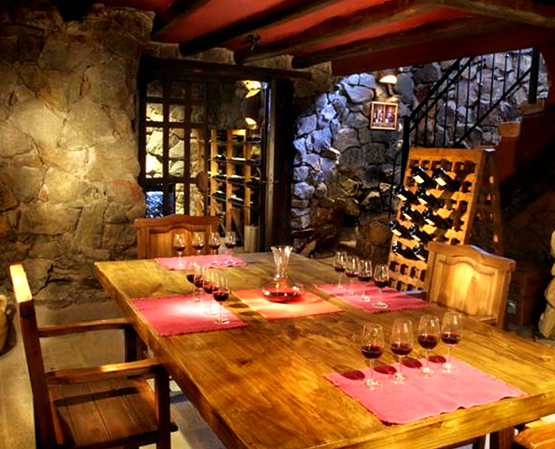 The atmosphere is perfect to allow yourself to be seduced and for tasting the best wines of Mendoza. This space holds the mysticism of wine; celebrates the pleasure kept in each bottle, each time a bottle is uncorked and every time a toast is shared. We offer a wide variety of wines, accompanied by delicious dishes from Mendoza. Vineyards: Lares de Chacras has a field, 55 km north of Chacras de Coria, cultivated with grapes in the torrontes and syrah varieties, olive trees in the arbequina, Arauco and grantoio varieties and D’agen plum trees. Wine Tours: The Wine tours can be combined with two collaborators for Lares de Chacras. Just a few kilometres away from Lares you can find many wineries, such as: Altavista, Luigi Bosca, Cavas de Weinert, Finca La Amalia, Nieto Senetiner, Viniterra, Dominio del Plata, Terrazas de los Andes, Catena Zapata, Trivento, Flichman, Palo Alto. 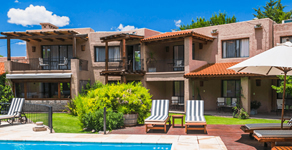 Chacras de Coria is situated in Lujan de Cuyo department just 15 minutes from Mendoza city. It is a residential area of farm houses, that is distinguished for its entertainment proposals. 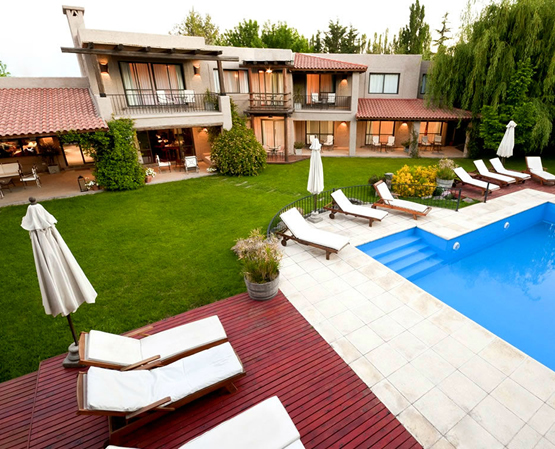 Special microclimate, typically "mendocinos" landscapes of wooded streets and mountains just 25 minutes from Mendoza International Airport. 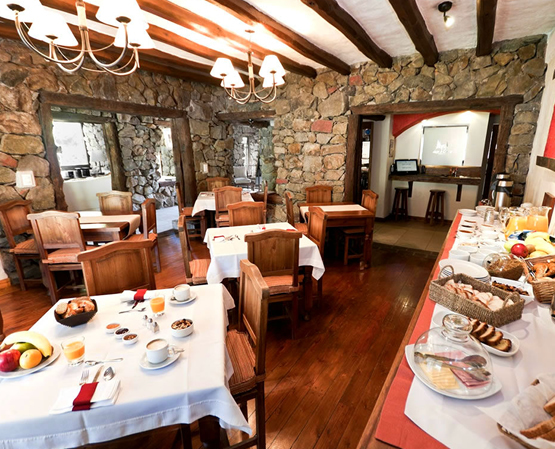 Lares de Chacras is on Larrea St. Nº1266 just 50 meters from Viamonte St.